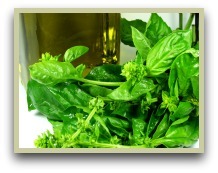 Countries throughout North Africa and Europe are the major producers of basil essential oils which are sold around the globe for health and well-being uses. By gently steaming the entire plant, including both the leaves and the flowers, the oil can then be extracted. ... And is packed with many beneficial chemical compounds; eugenol, camphor, citronellol and cinnamante to name just a few. And it's these chemical compounds that give the various varieties, Thai basil herb and sweet basil herb for example, their distinctive aromas and also their many therapeutic and healing properties. Other types will have different chemical make ups. It can often be blended with other essential oils for specific purposes, and it blends well with peppermint, lavender and eucalyptus. Note: It's recommended that children under 16 and pregnant women should not use it. But it's not only the basil essential oils that are healthy, the leaves, stems and seeds also have nutritional benefits as well as adding massive flavours to your home cooking. And a good way of having a continual supply is to grow it yourself. It's not too difficult to do, and a few plants will give you a fresh harvest from spring to fall. See the growing basil plants page for detailed step-by-step tips and advice. If you don't have any oil, a particularly good, and cheap, way of enjoying the basil health benefits is to use the chopped leaves to brew a cup of tea. A quick, tasty and very healthy drink. For more tea recipes, click the ad below. Clove - Has antiseptic properties and is great for toothache!